Caption slip reads: "Photographer: Mitchell. Date: 1954-04-21. Reporter: Lewis. Assignment: Blonde collapses in court. 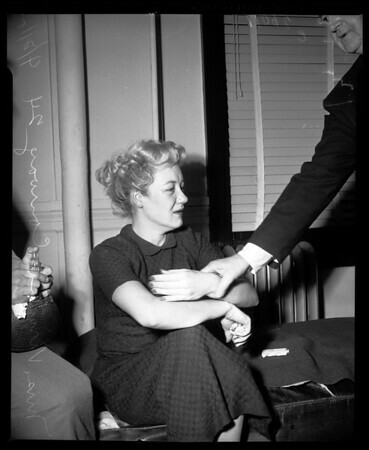 14: Mrs. Virginia Ruby Conway, 24 who collapsed in court after judge gave her year in jail & 5 year probation. If other woman shows its her mother, Mrs. Martha Price".